I introduced to you all basic about Hibernate, so you will know in Hibernate, object implements SessionFactory interface, will hold information related to the database connection, the entity to manipulate the database. It’s better if this object is managed by Spring, when we need it we can get it to use immediately. In this tutorial, I will guide you all how to use Hibernate in the Spring framework. For Hibernate, Spring 5 supports only one class to create an object implement SessionFactory interface, that is LocalSessionFactoryBean. This object allows us to declare information related to the database, the entity so we do not need to have the configuration file for Hibernate anymore. The first attribute is related to the Data Source. The Data Source here we can understand, it is the management of the connection to the database. We can declare many different types of Data Source as many different organizations implement the javax.sql.DataSource interface. The second attribute we need to declare is the information related to the entity. In this tutorial, I only define one entity, Student. Final attributes are some of the attributes related to Hibernate. 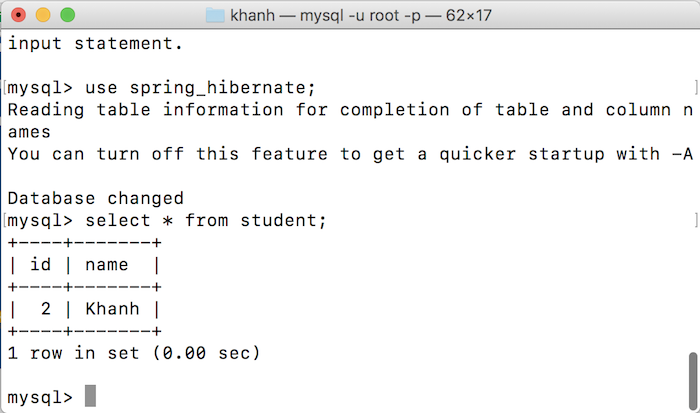 We will use the dialect of MySQL, MySQLDialect and will display the SQL that Hibernate uses to execute the database.